Today’s Pedal Line Friday submission is from James Mercer. 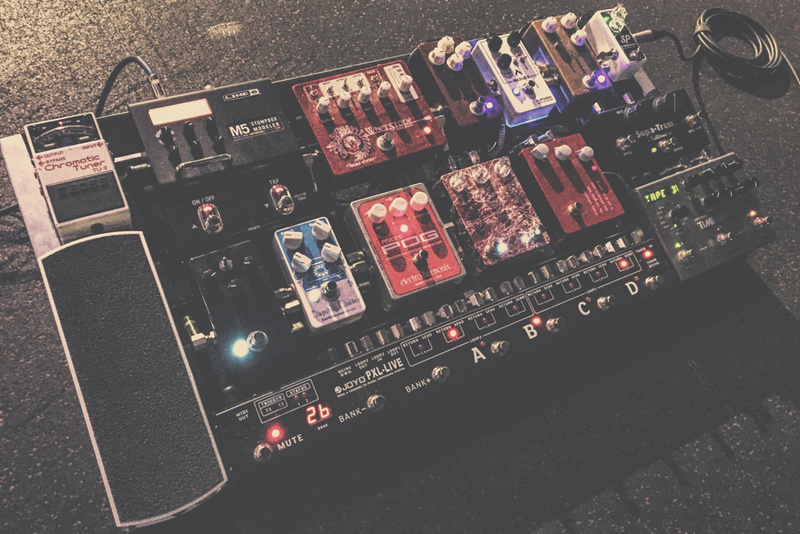 If you have a pedal line (doesn’t have to be in a board) for your rig, please email me a photo, bio, description of pedals and routing to pedalline@nulleffectsbay.com. Every Friday I’ll showcase a pedal line submission. Make sure you include any links to your band or music page. I am the Band Director at Life Link Church is Gilbert AZ (www.lifelinkchurch.com) and this is my main pedalboard for weekends. I primarily play on electric, and it means while I’m playing rhythm, lead, doing talk back, and running tracks, I need versatile tones and have to limit tap dancing… any that’s where my pedal line was born. – this is the first compressor I have ever used that takes both singles and humbuckers without tweaking. It’s always on. Loop 2) Blackout Effectors Whetstone – I don’t like using a wah but I dig that sound for leads, so I have this pre-drive to get a subtle wah effect for leads. Loop 3) JHS Morning Glory > Kartakou Warmer – this is a light gain stage that I will stack on the KTR. I will switch between either drive depending on what tone I am feeling on a particular set or guitar. The MG is set up for that sweet spanky crunch tone, and the Warmer (a highly modified tube screamer with swappable IC chips) is set for a more saturated blues sound. I also have the JHS setup with a trigger from the PXL to switch to the “red” higher gain stage for some patches. Loop 4) JHS Charlie Brown > Custom Pedal Projects DLS MK1 clone – this is a heavy gain stage that I will stack on the KTR. I will switch between either drive depending on what tone I am feeling on a particular set or guitar. The Charlie Brown is getting that saturated JTM45 tone, and the DLS is more of a modern drive tone. I had the DLS built for me based off the original Dirty Little Secret, but had him give me the rock/rawk switch as a stomp instead of a mini switch. Loop 7) EarthQuaker Devices Dispatch Master – I have it set to a subtle reverb with a touch of repeats. I like how it widens and adds dimension. Almost always on when I’m playing clean. Loop 8) Midnight 30 Music Forester – It is basically a Boss FA-1 clone, that I use at give me a solo boost and slight tone change to cut through the mix. – This is my main delay pedal. I use a number of different presets, depending on the patches. – This is setup to be mainly reverbs and occasional delay. I might pull up some weird sounds if I need to capture a tone from specific songs. MIDI out > Timeline > M5 – I am able to call up presets on both of the pedals. I have them both set to global tap so I can change patches mid song without loosing my tempos. Trigger 1 > JHS Morning Glory – like I said earlier, this version of the Morning Glory has an insert on the side to switch to a higher gain mode. I am able to switch the settings on the MG according to what patches I want. Tuner Out > Boss TU2 – with the dedicated tuner out I am able to have the tuner out of my signal path and I can run it at all times, using my volume pedal to tune silently. It’s a little big and really heavy, but this board is allowing me to be able to focus on leading the band and not have to jump all around a pedal board. The board outputs back stage to a Fender Landau Deville and is Mic’d up for ears and front of house. I keep a handful of guitars back stage to give me tonal flexibility. This is pedal line for me for a while!